Karl Fischer is used to determine the water content of samples. It can be more accurate than simple weight loss because in the weight loss method volatiles other than water can be lost which is translated into an artificially high water content. Knowledge of the moisture content can be important since some polymers degrade when molded wet resulting in reduced properties. Also, hygroscopic materials like nylon absorb moisture and knowledge of the water content can be important in understanding performance. A small weighed sample is placed into the Karl Fischer drying oven at a predetermined temperature for a predetermined period of time. The time and temperature values are arrived at by testing a similar material and varying the temperature and bake time independently to determine optimal conditions for removal of all water in the sample. If the temperature is too low or the retention time too short all of the water might not be driven off. A temperature value too high can degrade the polymer and actually generate water in some cases. 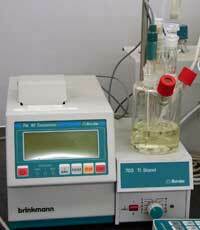 The water in the sample is vaporized and carried by dry oxygen free nitrogen into a reaction vessel with methanol. The methanol traps the water which is titrated to an end point with a Karl Fischer reagent to determine the amount present. Water content in percent or parts per million is determined.